Although this book is now published by St. Martin’s Press, my first encounter with Song of Blood & Stone was in 2016 when an earlier version of it was entered into the Self-Published Fantasy Blog-Off, the writing competition created by author Mark Lawrence. Ever since the SPFBO’s launch, several of its alum have already been picked up by traditional publishing, and it’s always great to see that number grow by the day. As I understand it, the novel has gone through many changes to get to this point, and as I am fascinated by indie publishing success stories, I was excited to check it out. At its heart, Song of Blood & Stone is a fantasy romance. Starring Jasminda, a young woman of mixed descent, the story is set in world split by a veil called the Mantle which separates Elsira, a land with no magic, from the country of Lagrimar, whose people possess the power of Earthsong. However, the two nations are divided by a lot more. On one side, citizens are forced to worship and fear the True Father, a power-hungry tyrant who hoards the world’s magic for himself, while on the other side, the Queen Who Sleeps lies dormant, leaving her subjects directionless and without their true ruler for centuries. The Mantle has only been breached a few times in history, but every time it has happened, chaos and death have been the result due to the intense fighting and struggle for power. As a child of two peoples, Jasminda grew up as an outcast in her mother’s homeland on the Elsiran side of the Mantle simply because she has inherited her Lagamiri father’s darker skin as well as his magical abilities. Ever since the deaths of her parents and siblings, she has lived alone maintaining a small goat farm by the mountains. One day, her quiet existence is interrupted by a group of Lagamiri soldiers at her door. Not realizing they have crossed the veil into Elsira and believing her to be one of their own, they demand that she open her home to her country’s soldiers and shelter them from an incoming storm. With them is a battered and broken prisoner named Jack, whom the soldiers claim is an Elsiran spy. Using her Earthsong, Jasminda heals Jack and helps him escape, and together they embark on a dangerous journey to warn the capital that the Mantle is about to fall once again—and that their people must prepare for war and another incursion from the brutal True Father. Well written with beautiful and detailed flowing prose, Song of Blood & Stone showed immense promise right from the beginning. The world-building was compelling, and it is clear that L. Penelope put a lot of work and thought into formulating the book’s background and premise. The author’s characterization of Jasminda was also very well done, establishing her situation and making her a sympathetic protagonist to readers right away. However, bearing in mind that this is a fantasy romance, these developments soon give way to the themes surrounding Jasminda and Jack’s burgeoning love story, which may prove frustrating to those who aren’t big readers of the genre. Personally speaking, I wish there had been a better balance between all the elements of the story, especially when the romance started taking priority over developing the characters and world-building. I also felt that there was very little lead-up to the romance itself, as Jack started developing feelings for Jasminda from the start, even as he was being held captive. Although I wouldn’t go so far as to call it insta-love, I still wish that the author had held off on exploring their emotions for each other until after they actually managed to escape (or at very least, waited until they’d known each other for more than a few days). In time, the plot also revealed itself to be rather simplistic, despite the complex nature behind the history and politics of Elsira and Lagrimar. Part of this is due to the aforementioned lack of world-building once the characters arrive in the city. Queue the romance drama at this point, which—unsurprisingly—also began to impinge upon the story’s pacing. Racial conflicts and the problem of Lagamiri refugees in Elsira also started becoming central to the plot, and in this middle section I felt that the author was trying a bit too hard to inject real-world issues into the book. Normally I wouldn’t mind this, except that it was done very blatantly and at the expense of world-building and character development, ultimately making me feel less connected to the protagonists and their world, which became confusing to me. I had trouble picturing the characters’ surroundings and was never truly able to grasp the setting which came across as a mishmash of genres and time periods thrown together, with ancient magic, mysterious visions and immortals mingling with steampunk elements like airships and more modern tech like automobiles. World-building was certainly creative and ambitious, but due to the lack of attention in developing these ideas, things ended up being rather messy, which was unfortunate. In sum, parts of this book worked well for me, while others didn’t so much. However, I do think readers who are more inclined towards the romance genre will probably like this one a lot better. 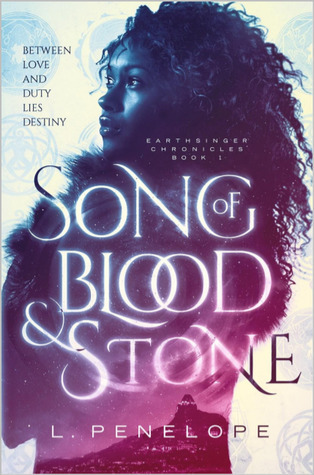 While I personally prefer my stories, love or otherwise, to feature a more balanced approach to plot, characters, and world-building, if a fantasy romance is something you think you’d enjoy, then I highly recommend giving Song of Blood & Stone a try. Bleh. I probably would have avoided this simply based on the name “Jasminda”. Haha! All joking aside though, I should have heeded some of the reviews. Please sign my petition making me Book Czar of the World. As YOUR Book Czar, I will tirelessly work on your behalf making sure this kind of disgraceful incident never happens again. I will pigeonhole authors down to the Nth degree AND I will make them give their books away for free all the time. That’s right, a vote for Bookstooge for World Book Czar is a vote for Free Books! Probably not a book I’ll read as most of the reviews I’ve seen have been similar to yours. But I agree, it’s nice to see indie authors going traditional! Yeah, it’s always nice to see self-published authors make the jump to the big publishers! I have a copy of this and will probably pick it up someday. I don’t mind the romance element as long as there is something else going on and there is no insta-love. I have really shallow reasons for liking this book – I want that girls hair. Well, that and the colors. It really is a great cover. Great review! Then you will probably enjoy this one more than me! And I agree, that’s a pretty cover. I think you would enjoy it! You are more into romance fantasy than I am! Yeah, the SPFBO is such a great initiative. I’m glad it’s getting bigger each year and that good self-pubbed books are being picked up by traditional publishers! If this is romance oriented then I shall be skipping it. I had enough of that in Warcross. Oh, I didn’t enjoy the romance in Warcross either. It would have been a better book without it. Not for me although I was eyeballing it for some time. I love the cover and I did fancy picking it up but my May has gone to hell in a handcart due to all sorts going on and so I’m glad I didn’t add more to my pile. Shame it didn’t work out better though.